Toilet History | About A Toilet and more! The modern flush toilet has been shaped by many innovations in design and functionality. Nowadays, there are dual-flush toilets, portable toilets, one-piece toilets, toilets with built in bidets, toilets with heated seats, toilets with seats that raise and lower automatically, waterless toilets, and eco-san (stands for Ecological Sanitation) toilets. Toilets today can handle a great deal more waste and refuse than its predecessors while using half the water. Toilet manufacturers such as Kohler and American Standard have become household names. TOTO Toilets have also become very popular. Many people say that one of man’s greatest gifts to civilization was the toilet and the modern plumbing system. Indeed, it would be near impossible for us to live in these great urban areas if there were no way to receive clean water and to remove all of the waste. The toilet plays an important part in our society. It is about time that we sat down and took notice. Dictionary.com defines a toilet as "a bathroom fixture consisting of a bowl, usually with a detachable, hinged seat and lid, and a device for flushing with water, used for defecation and urination." The idea of toilets has been around since the third millennium. Although some claim the earliest idea of toilets can be found in Skara Brae in Orkney Scotland, evidence also suggests that toilets along with rudimentary drainage systems were in use in parts of what is now Pakistan and north-western India. Additionally, toilets have been found to have been used in ancient Persia, Egypt, and Crete. 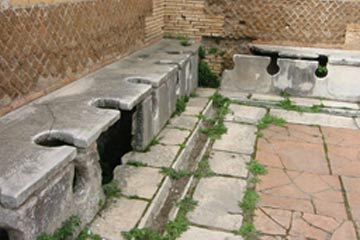 During the time of the Roman Empire, toilets were incorporated into the design of some of their signature bath houses. For a long time, the first recorded design of a flush toilet was credited to Sir John Harington in 1596. Tradition has it that Harrington was the godson of Queen Elizabeth I and that he invented the device for him and his godmother to use. The rest of the public found this particular invention foolish and of no use, so Harrington never produced any more. In 2000, however, an archaeological dig in China revealed a 2000 year old toilet for a king who reigned during the Western Han Dynasty. The toilet was equipped with running water, a carved stone seat, and an armrest. Although, not made of porcelain, it is conceivable that this is the first instance of a toilet being considered a "throne". The Chinese, incidentally, are also widely credited with having invented toilet paper. 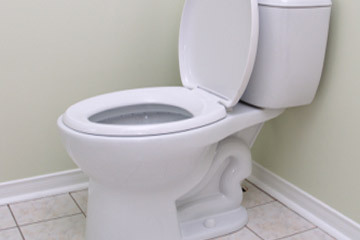 The advent of the modern flush toilet really began in the 1700s. Alexander Cummings improved on Sir John Harrington's design by adding an "S-Trap", a valve that would slide between the water bowl and the trap. Soon, others began making improvements and the "Water Closet" began to appear in more affluent homes. Most of the toilets in that time were made of either wood, cast iron, or ceramic. In the 1870s, that all began to change. The Thomas Twyford Company of England displayed its all porcelain "Dolphin Wash-out" at the Philadelphia World's Fair in 1876. 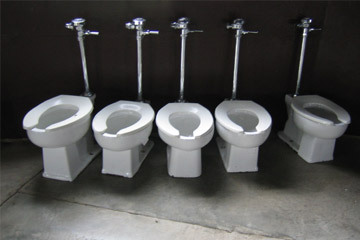 The design and concept was a hit, and soon toilets were being imported from England and manufacturers in the US began producing toilets for American use. Then came "the Crapper". Thomas Crapper was a plumber and inventor in England (Yes, folks. He really did exist. It is not some myth or urban legend). Over the course of his life, he operated three Crapper Plumbing Shops, was awarded 9 patents for plumbing and drains related innovations, and served as a Royal Sanitary Engineer for members of the royal family. Although some mistakenly call him the inventor of the toilet, the modern-day versions of the toilet would not exist were it not for some of Mr. Crapper's inventions.